Get ready for an unexpected hit. Opening weekend $4.266 million on 2164 screens. Rated R for language and sexual references. What�s worse: a crummy movie with no talent behind it, or a mediocre flick with scads of fine folks at work on it? I�d go with the latter as being more painful to watch. When high expectations crash down around you, that can be a tough sight to take. I thought that Warner Bros. satisfied their spring 2002 quota of big-name disappointments with the execrable Showtime, but apparently they still had room on the schedule. 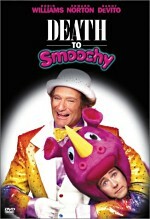 Thus we also got Death to Smoochy, an overdone and fairly lifeless black comedy. While it didn�t fall to the depths of Showtime, it wasted even more talent and seemed like a major disappointment. At the start of the show, we meet Rainbow Randolph (Robin Williams), the hugely successful host of his own TV kids program. He quickly gets bounced from the tube after he accepts a bribe, so the powers-that-be at Kidnet need a squeaky-clean replacement. They find less-than-talented Sheldon Mopes (Edward Norton), a na�ve idealist who performs as Smoochy the Rhino. He quickly learns about the corrupt world of children�s entertainment. He meets cynical TV executive Nora Wells (Catherine Keener), sleazy agent Burke Bennett (Danny DeVito), brain-damaged ex-boxer Spinner Dunn (Michael Rispoli) and his Irish-mafia chieftain cousin Tommy Cotter (Pam Ferris), greedy charity head Merv Green (Harvey Fierstein), and others. Smoochy�s show rockets up the charts, which sends Randolph on a mission of revenge. After some failed attempts, he finally scandalizes Sheldon when he tricks him into performing in front of a crowd of Nazis. Eventually Sheldon regains his spot and his popularity, and with that comes additional power. His bosses pushed him to do an ice show, and he finally agrees, but he uses his newfound power to create an extravaganza that does things his way. Sheldon�s idealism scares the bigwigs, so they start to plot for his removal via violent methods. When I first heard of Smoochy, I thought it looked like a can�t-miss proposition. With director Danny DeVito behind the camera plus such an excellent cast, how could this movie not succeed? Amazingly, the end result almost totally misfired. How did this occur? That�s a good question. On the surface, the movie didn�t do anything particularly wrong - except for one issue. I felt Smoochy seemed much too long. Writer Adam Resnick comes from the world of TV - he used to work on the old Letterman show and on Chris Elliott�s cult classic Get a Life - and Smoochy came across like an extended sitcom. The basic story seemed clever and witty, but the flick simply went on and on and wore out its welcome. The piece included maybe half an hour of useful content, but the filmmakers stretched it to feature length, which made it less than enjoyable. Otherwise, Smoochy had no obvious flaws. The cast all seemed acceptable. Oddly, Norton appeared to channel Matthew McConaughey for his performance as Sheldon, but I found no significant problems with his work. All of the actors overact relentlessly, but that made sense for this kind of flick. The script included a moderate level of funny bits, but quite a few of the gags fell flat. The humor seemed hit or miss, with a lot more duds than strikes. However, few of the jokes came across as total flops; the bits usually looked almost funny, but they didn�t quite cross the line to become genuinely amusing. Perhaps the best word to describe Death to Smoochy is �dull�, which is perhaps the greatest problem I can imagine for this sort of outrageous black comedy. The cast all work overtime to try to sell the material, but the source seems thin and lifeless for the most part. The movie never catches fire and it remains a flat and unengaging offering. Death to Smoochy appears in an aspect ratio of approximately 1.85:1 on this single-sided, dual-layered DVD; the image has been enhanced for 16X9 televisions. For the most part, the picture looked excellent, but a few small concerns knocked it below �A� level. Sharpness seemed solid as a whole. A few wide shots displayed a little softness, but those issues caused no serious problems. Mostly the movie appeared crisp and detailed. Jagged edges and moir� effects created no concerns, but I did notice a little light edge enhancement at times. As for print flaws, the image looked clean. I saw no examples of grit, speckles, grain or other issues. As one might expect from a film that featured a goofy kids show, Smoochy enjoyed a very vivid palette, and the DVD displayed those tones nicely. Colors appeared bright and vibrant throughout the movie, and they really popped off the screen at times. I saw no issues related to noise, bleeding, or other problems. Black levels came across as deep and dense, and shadow detail seemed fine for the most part, but a few low-light scenes were slightly murky. Ultimately, Death to Smoochy looked quite good. While the Dolby Digital 5.1 soundtrack of Death to Smoochy featured no noticeable flaws, it suffered from a distinct lack of ambition. The soundfield remained heavily oriented toward the forward channels. Music showed solid stereo imaging, while the mix also offered general ambience that spread nicely across the front. Some audio panned across that domain - such as when Randolph lost a tooth and it rolled to the side - but not a lot of activity happened from the sides. The surrounds contributed general reinforcement most of the time. They displayed light support for the music and effects, but little more than that. During the scene when folks harass Sheldon, their voices emanated from all around the spectrum, but that offered one of the few segments in which the surrounds distinctly came to life. Audio quality appeared positive. Speech came across as natural and warm, and I noticed no issues related to edginess or intelligibility. Effects played a small role in the flick, but they consistently sounded clean and accurate, with acceptable low-end response when appropriate. Music seemed clear and bright, with decent dynamic range as well. Nothing about the Death to Smoochy soundtrack stood out, but it appeared fine for this kind of film. This DVD release of Death to Smoochy packs a mix of supplements. These start with an audio commentary from director/co-star Danny DeVito and director of photography Anastas Michos. Both men recorded separate running, screen-specific tracks, and the results were edited together for this piece. At its start, DeVito loosely acknowledged the film�s poor reception; he stated that after a few months, the mourning period ended. However, with that funny remark, we heard the first and last reference to the fact the movie tanked. After that, the commentary offered a fairly relentless string of happy thoughts. To be fair, both DeVito and Michos provided a reasonable amount of information, although their notes tended to be fairly dry. They focused on the technical elements. This didn�t seem surprising in regard to Michos� side of the piece, but I would have liked looser statements from DeVito. He tossed in some notes about other elements and even gleefully pointed out some continuity errors, but mostly he stayed with the nuts and bolts parts of making the film. That would have been fine had he and Michos stayed away from so much praise for the flick. From start to finish, I was inundated with comments about how great everyone was and how terrific the results were. It�s nice that they like their product so much, but it seemed annoying to have them tell us this so frequently. The commentary may work for big fans of the movie, but it did little for me. Since it only runs seven minutes and 38 seconds, the Behind the Scenes Documentary obviously doesn�t offer a lot of depth. Nonetheless, the short program seems fairly entertaining. While it tosses in some movie snippets and soundbites from folks recorded during the shoot, it mostly consists of footage taken from the set. We get a good look at the methods used to bring Smoochy�s world to life, and we also find some funny improv bits and other amusing moments. It doesn�t substitute for a real documentary, but it seems much more useful than most programs of this length. Next we get 10 Additional Scenes. Each of these lasts between 17 seconds and 62 seconds for a total of six minutes, 25 seconds worth of footage. A quick text card between segments tells why they were cut from the final film. None of it seemed terribly interesting, but I felt happy that they tossed it onto the DVD. While the Bloopers and Outtakes section includes some of the standard goof-up and giggle moments, the four and a half minute montage offers a lot more entertaining material than usual. With guys like Robin Williams and Jon Stewart on the set, some lively improves became inevitable, and �Bloopers� provides a lot of funny stuff. Heck, it�s more amusing than the movie itself! For the Interactive Ice Show, we get a multiangle feature. This nine-minute piece lets you cycle through four different angles for the ice show part of the film. It doesn�t seem any funnier here, but it still provides a decent bonus. In addition, it offers a good interface; just press the keypad number for corresponding angle, so you don�t need to whirl through all four to get to the one you want. Within the Magic Cookie Bag, we get a collection of stillframe materials. �Behind the Scenes Stills� includes 29 shots from the set, while �Production Design� provides nine images of conceptual art for the film�s sets. �Costume Design� gives us 20 stills of more art, plus a shot of Norton in partial costume. �Other Art Materials� shows 41 images of promotional pieces created for the movie�s world; we see things like publicity stills of Randolph and Smoochy. �Production Stills� offers 67 stills from the film, while �Smoochy�s Summer Vacation� is something more unusual. Shot on his own post-movie vacation by director of photography Michos, this shows a Smoochy action figure as he travels the world. The 47 frames go from Africa to Asia to Europe - looks like Michos took a hell of a trip! After this we find three trailers. This sections includes the film�s theatrical clip as well as two �alternate� trailers, neither of which ever saw the light of day prior to this DVD. 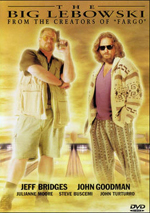 Cast and Crew includes filmographies for actors Robin Williams, Edward Norton, Catherine Keener, and Jon Stewart, screenwriter Adam Resnick, and director/co-star Danny DeVito. Lastly, Smoochy tosses in a few DVD-ROM features. These consist totally of weblinks. 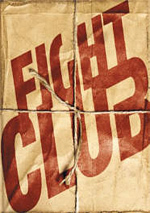 You can connect to the film�s official website, a Warner Home Video spot that advertises their latest DVDs, Warner Bros. Online, and their standard �Special Events� page. They don�t update the latter very frequently; as I write this in mid-September 2002, they list some June titles as �coming soon�. The DVD-ROM area also lets you sign up for WB�s �Movie Mail�. Blessed with an inspired concept and an excellent cast but cursed with flat execution, Death to Smoochy came across as a fairly witless piece of work. The film fell far short of expectations and seemed like a largely leaden, lifeless film. The DVD offered generally positive picture and sound plus a reasonably decent roster of extras. If you know you like Smoochy, then the DVD will merit your attention, but otherwise, I�d recommend you skip this clunker.